Modern and Elegant UI provides way for rich visualization of status and configuration options. Offers mechanism to add, monitor and control any number of devices with a single instance of App. Up to 32 Relays and Inputs and Analog Inputs/Outputs can be monitored and controlled. Supports simple user name and password based authentication preventing unauthorized access to devices. GSM Relay controls and switches are widely used in places that need remote monitoring and control of devices. While there are many technologies, SMS based control is one major method. It involves using short SMS based commands to receive current status of the devices and set status of the devices. Sometimes phone calls can be made to the device activating a pre-defined set of configuration. Though SMS based control is quiet easy method, preparing commands manually and sending them to devices will be tiresome. If it involves multiple devices, then tracking these devices will be even difficult. Being leading technological problem solvers, Embien has designed and developed a Android based application called the DAQ Suite to ease management of such devices. 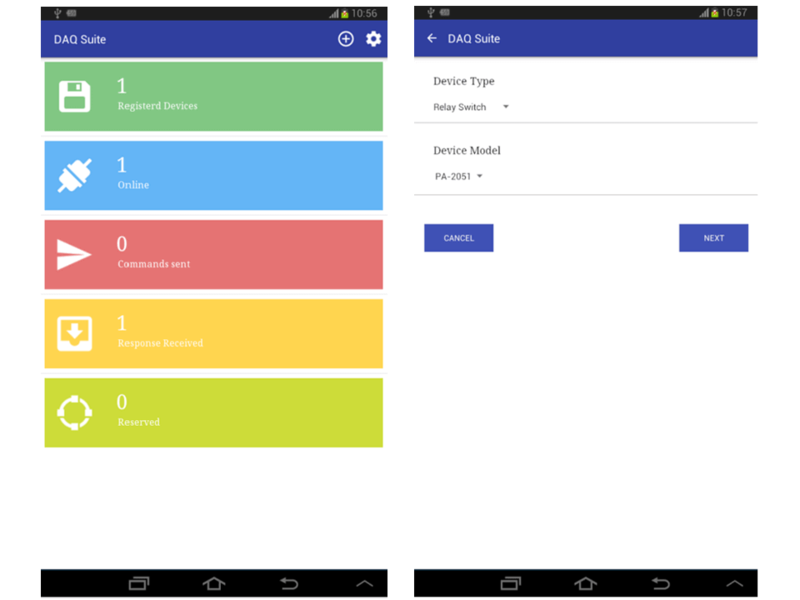 With this Android controlled switch App, the device management has become easier. DAQ Suite is a user friendly Android application for managing various applications such as GSM relay controllers/Switches, USB relay switches etc based on platform such as Arduino, Raspberry PI, eStorm-L1 etc. The application is a graphical collection of complex preset SMS command that are used to the control the devices by providing a powerful and rich user expereience. is well suited for the applications that involve remote control of the devices in many sectors such as industrial, consumer, automotives, etc. In this screen, all the information about the device that are registered, online etc are consolidated. In addition to the device information, a log of the number of SMS commands being sent and received are also displayed. Lists all the device variants commonly available with eStorm-L1 platform such as relay switch, relay controller, etc. Lists all the model numbers available under the selected device type. There are multiple device models based on analog inputs and digital input/output configurations. 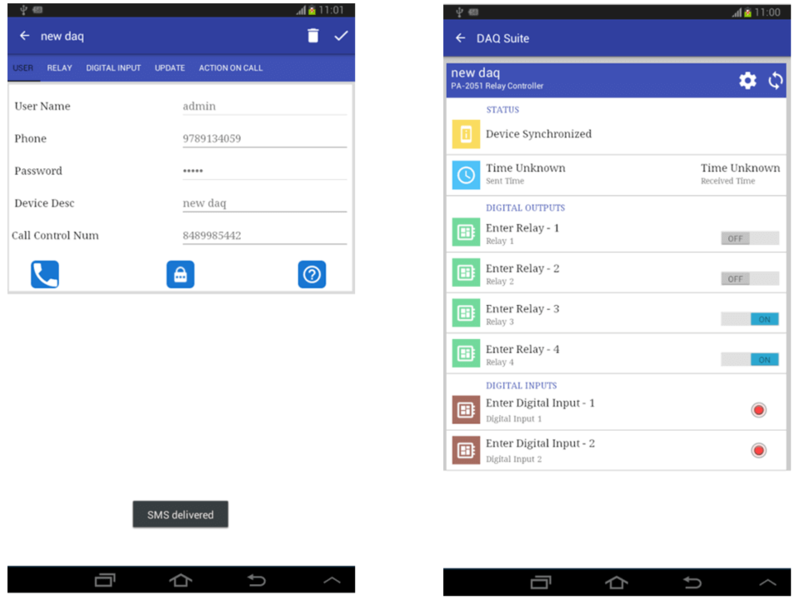 At present, the DAQ Suite Android application includes two device type and two device models where the same will be updated with multiple options in the later revisions as needed by the customer. To set the user details such as name, password, phone number and device description. The device under control will be configured with the provided user name, password and phone number for the authentication. This screen also supports setting alternate phone number to be considered for control upon calling the device. This settings menu corresponds to the digital input settings such as name, on/off de-bounce, input enable/disable etc. Supports settings for actions to be done on the digital outputs such as switch ON/OFF upon calling the device. Each setting is configured to the device with separate SMS command and this happens upon selecting the tick button on the right corner of each settings menu. Once all the settings are configured, the device will be ready to receive SMS commands for the control/monitoring actions. Upon every change in the device screen, SMS will be sent to the device with the predefined command set and the respective status will be updated in the device screen once the acknowledge SMS is received from the device. For customization of the Android relay control App for your devices and improved customer satisfaction, feel free to contact us.